Click on the links below to download free preview pdfs. Further company profiles will be added over the coming days. Promotion to health workers (coming soon). Kendamil brand (Kendal Nutricare) – Company response: It will change labels, end sponsorship and no longer target toddler groups – full statement. Mamia brand (Aldi) – Notable marketing claims: Unique blend – suitable for combination and bottle-fed babies. Minbie – Notable marketing claims: Introduce it as early as day 1 – Nurtures a proper breastfeeding latch. Company response: Company defends marketing strategy as supporting breastfeeding – full statement. 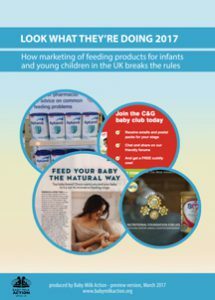 NUK – Notable marketing claims: Natural – Optimal combination of breast and bottle feeding UPDATE: NUK to drop false “clinically proven” claim plus Managing Director responds to monitoring report – Advertising Standards Authority and company responses. Aldi – Also markets its own-brand Mamia infant formula. Boots – Notable promotions: New, New, New. Baby Event. 2 for £15. Follow us on Facebook and Twitter for news of when the next profiles are posted, or check back tomorrow. Many thanks to everyone who has sent us information on promotions they have seen. A representative selection of these are included in our report. Please continue reporting examples to Baby Milk Action and the authorities. Please join Baby Milk Action or send us a donation to help us print the full report and campaign for better enforcement and regulation. The cases highlighted in the preview profiles are being pursued with the enforcement authorities and companies responsible. We will update these profiles with news of changes made to marketing practices prior to finalising the report for printing. We are also campaigning for the UK law to be brought into line with international minimum marketing standards. Please support the campaign in Parliament to protect all families from misleading marketing.